A DUBLIN RESTAURANT has been told by Environmental Health Officers working for the HSE that it must stop serving burgers rare and medium-rare to in order to avoid facing legal action. This morning, the Irish Times reported that management at Jo’ Burger in Rathmines received a letter stating that only well-cooked burgers can be served on the premises because of a risk of E. coli contamination associated with pink burgers. He said that at present only well-cooked burgers would be served at the restaurant, and that he regretted the restriction of choice for his customers. Mary Gleeson, a spokesperson for the HSE, told TheJournal.ie that while it was against HSE policy to comment on individual cases, under the Food Safety Authority Act of Ireland 1998, Environmental Health Officers could enter into a process with a restaurant that engaged in practices which could endanger public health. ”The HSE, with any potential danger to public health, work with food business operators to advise and inform them of the risks to public health and of the risks of non-compliance of legislation”, she explained. Gleeson said that after a period of consultation and communication, if a restauranter does not comply with the HSE’s instructions, it would then “take whatever action is required to protect public health,” she added; “This includes improvement notice, prohibition notice, or where necessary up to and including, a closure order”. Undercooked meat carries a risk of E.coli: a type of bacteria that can cause food poisoning, which can be present on a range of foodstuffs from beef, unpasteurized milk or cheese, and even lettuce. Mince used in hamburgers is considered risky because bacteria living on the surface of beef can be mixed throughout the food when beef is ground. This means that burgers can potentially pose a risk of illness if they are not thoroughly cooked. Email “HSE warns Dublin restaurant over serving rare burgers”. 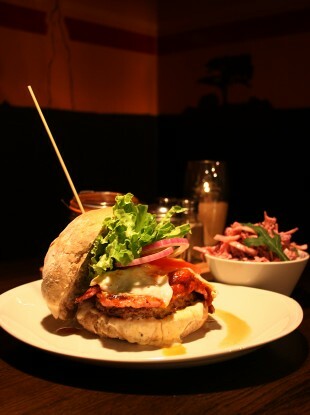 Feedback on “HSE warns Dublin restaurant over serving rare burgers”.